Here is an easy recipe for super spicy taco meat made in the slow cooker. This post also contains a simple solution to dealing with the heartburn brought on by spicy foods. Our family loves Mexican food, no matter the form! Sometimes it’s a casserole, sometimes it’s salad. The build-your-own style dinner is the most popular, because everyone gets to create their own plate of food how they want it. I often eat my ingredients as a salad. My daughter prefers a hard taco, while my son loves burrito style. However it’s made up, the same basic ingredients—some form of taco meat, cheese, and sour cream—are used by all. The latter two are always the same, but I vary the meat. 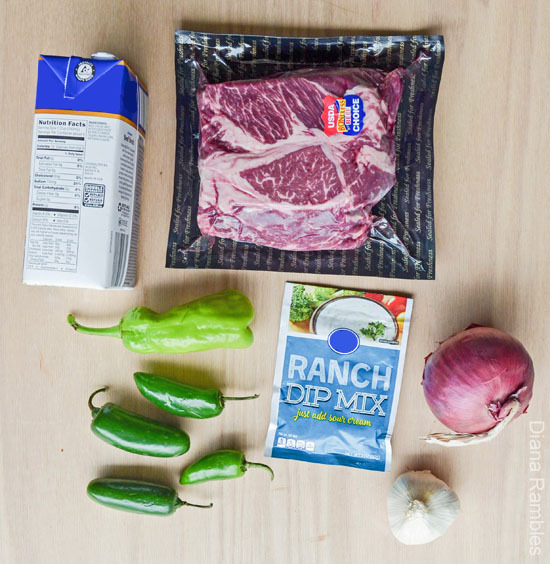 Recently, I made this spicy beef in the slow cooker and it was a big hit. Pour the beef broth over the roast. Sprinkle ranch seasoning over the roast. Cover with minced garlic and chopped onion. Place the chopped peppers on top. Cook on low for 8-10 hours or high 4-6 hours. Pull the meat out of the cooker and shred with a fork. Return the meat to the cooker and mix in with the juice that remained. Serve as desired with other toppings. I put together our ‘make your own meal bar’ with the spicy meat, refried beans, taco shells, tortillas, lettuce, cheese, sour cream, guacamole, tomato, onion, jalapeño, black olive, salsa and lime. This meat was really good! My family raved about it and was happy that there were leftovers to enjoy the next day. I loved how simple it was to make. I think this recipe would be good with chicken or pork too. decision I’m making now, and Nexium, effectively, allows me to enjoy spicy food without the repercussions. The purple pill is a simple solution to heartburn relief. It takes just one Nexium 24HR to give you all-day protection from frequent heartburn. Nexium 24HR can be purchased at your local Walgreens. I found my 42 capsule bottle in the heartburn/antacid aisle at a Walgreens just a mile away from my house. That simple solution is super convenient! Do you like spicy food? How do you deal with the heartburn that follows?